U.S. adversaries and the emerging threats they create span the globe. They range from economic superpowers to invisible microbes. While their ability to do harm grows, our government dictates responses that change at the drop of a hat. Sometimes these responses are well thought out and sound. Sometimes they are purely political and make no sense. There are two examples this week of what happens when these decisions are purely political. The first is Trump’s threatened shutdown over a border wall which became very real last night. The second is his plan to withdraw troops from Syria. The border wall scuffle is old news. We already know that only open borders will appease opponents of this administration. When faced with a shutdown even Republicans will cower. This should be a homeland security issue. Instead it is a solely partisan political charade. The uproar over Syria preceded Defense Secretary Mattis’ resignation announcement. It lends more proof that those calling the shots in Washington impact our national security even more than foreign actors. How months turned into days and started the hunt for a Mattis replacement is not a national security question. It is a political question that politicians will answer. What is truly threatening to our security isn’t who or what these adversaries are. It’s how politics dictates our response. Remember Obama’s red line in the sand over chemical weapons in Syria? Democratic Party amnesia aside, we’re still dealing with the consequences today. To make matters worse, Trump opponents are going out of their way to inform U.S. adversaries that our president is incompetent, irrational, and irresponsible not only in Syrian affairs, but everywhere else. The question has to be asked: are our biggest adversaries Putin, Xi Jinping, and Kim Jong-un or Schumer, Pelosi, and Trump? Instead of devoting resources to addressing threats, politics has turned America into the adversary. Overthrowing the Trump administration is priority number one for the incoming Democratic House. Every consideration that doesn’t involve getting rid of Trump will wait. That means important problems will be set aside while lawmakers and investigators race down every rabbit hole they can find. The frightening question is how far are we willing to compromise our security to block Trump’s every move? According to Democrats righting trade imbalances, countering Russian meddling, and stopping Chinese bad behavior are about Trump. These issues are not about protecting our nation against emerging threats from expanding superpowers. They are about one man who offends liberal politicians beyond their limits of endurance. This makes it easy to ignore warnings about threats like a “mass migration event,” 4 something that is probably inconceivable to House and Senate Democrats who don’t view limiting access at ports of entry to be a security issue. Instead, they see securing the homeland as racial and religious discrimination, xenophobia, and hate from Trump and his base. Representative Waters and her colleagues don’t mention that there hasn’t been a nuclear test since the two leaders talked. We may never see the detonation of another nuclear weapon from North Korea or anywhere else, but we can be certain that pandemic and drug-resistant diseases will emerge and kill. It’s easy to take for granted that our high-tech health care system can do anything if we throw enough money at a problem. It can’t. Ask any family who has lost a loved one to cancer or buried a child during the 2017 flu outbreak. Then consider what might happen when we are suddenly faced with a new threat that ignores antibiotics and vaccines that were not developed because politics came first. Politicians can’t cure disease. They can, however, decide where the money goes. The real crisis was about money, not disease. We can make an easy argument that one of the biggest emerging threats in the years to come will be from U.S. adversaries born, raised, and elected on our own soil who will seize any opportunity to shift attention to whatever they think gives them the most power, influence, and political mileage. This is how emerging threats are created, assessed, and responded to in the U.S. Our international adversaries will continue to grow and threaten while our domestic politics will prove to be at least as destructive as what we face from the rest of the world. Fixing problems in other countries to keep illegal immigrants out of the U.S. is not the responsibility of the president or U.S. taxpayers, but this is precisely the kind of wrongheaded, adversarial mindset that Democrats get away with. Unfortunately the latest Supreme Court decision on asylum eligibility for illegals bolsters their argument for open, insecure borders. Ironically, the high court announced their ruling the same day that the government shut down. Conservatives, the president, and Republicans in Congress are not our adversaries for defending American sovereignty. Our adversaries are politicians who refuse to do their job because they seek opportunity and advantage from anywhere they can get it, including Central America, regardless of the impact on the homeland and taxpayers. Yes senator, it’s stupid. It’s just as stupid as pointing out that those at the border don’t want a wall. If I was going to cross over illegally I wouldn’t want one, either. 1. “Briefing With Special Representative for Syria Engagement Ambassador James F. Jeffrey.” U.S. Department of State. December 3, 2018. https://www.state.gov/r/pa/prs/ps/2018/12/287752.htm, retrieved December 21, 2018. 2. “NATIONAL SECURITY. Long-Range Emerging Threats Facing the United States As Identified by Federal Agencies.” U.S. Government Accountability Office. December 2018. p. 1. https://www.gao.gov/assets/700/695981.pdf, retrieved December 18, 2018. 6. “Waters Statement on Donald Trump’s Embrance of our Enemies & Hostility Toward our Allies.” Maxine Waters. June 13, 2018. https://waters.house.gov/media-center/press-releases/rep-waters-statement-donald-trump-embracing-our-enemies-hostility-toward, retrieved December 21, 2018. 7. “Why We Need a Public Health Emergency Fund.” Rosa DeLauro. January 22, 2017. https://delauro.house.gov/public-health-emergency-fund, retrieved December 21, 2018. 8. “2017 Case Counts in the US.” Centers for Disease Control and Prevention. https://www.cdc.gov/zika/reporting/2017-case-counts.html, retrieved December 21, 2018. 9. “2018 Case Counts in the US.” Centers for Disease Control and Prevention. https://www.cdc.gov/zika/reporting/2018-case-counts.html, retrieved December 21, 2018. 10. “Menendez Statement on Trump Shutdown.” Bob Menendez. December 21, 2018. https://www.menendez.senate.gov/news-and-events/press/menendez-statement-on-trump-shutdown, retrieved December 23, 2018. 11. “Murphy Statement on Government Shutdown.” Chris Murphy. December 22, 2018. https://www.murphy.senate.gov/newsroom/press-releases/murphy-statement-on-government-shutdown, retrieved December 23, 2018. 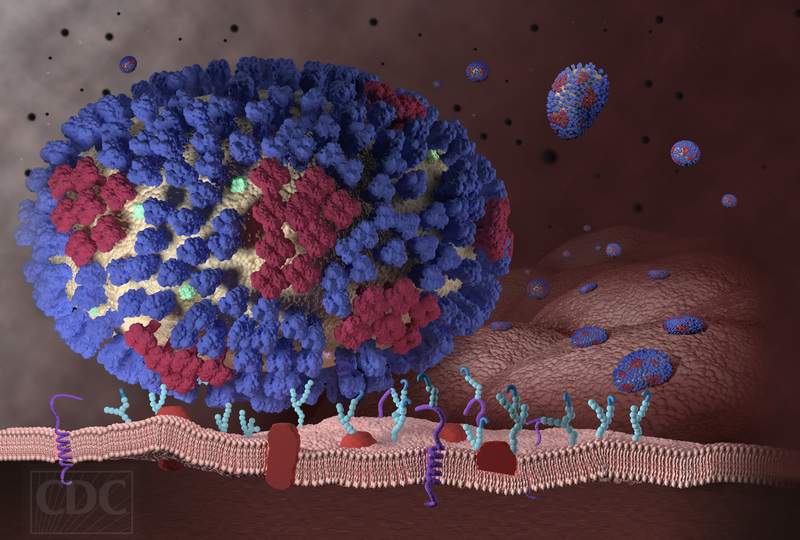 Image retrieved from “Understanding Influenza (Flu) Infection: An Influenza Virus Binds to a Respiratory Trace Cell.” Centers for Disease Control and Prevention. https://www.cdc.gov/flu/images.htm, retrieved December 21, 2018.